Now that warm weather has finally arrived, summer fashion trends are beginning to peak in popularity. One trend that keeps showing up in my Instagram feed is the vertical striped blouse. I absolutely love this trend both for its unique look and its versatility. 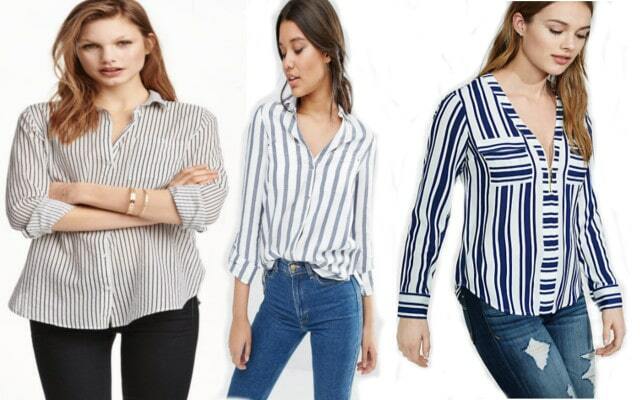 A vertical stripe blouse can go from professional to casual so it’s a perfect pick whether your summer involves tackling a few classes, relaxing at the beach, or both. Continue reading to see how a vertical stripe blouse can be styled from a day of classes to a night out. For a daytime look I made the vertical striped top casual by pairing it with some ripped jean shorts, slip-on sandals and some simple jewelry. This outfit is comfortable and chic – it would be perfect for looking cute while sitting through summer classes and dreaming of the beach. For a night out look, I paired the blouse with a skort, heeled sandals, stackable rings, and a simple necklace. As with the daytime look, I suggest pairing the blouse with neutrals in order to keep the focus on its bold stripes. This top speaks for itself and definitely makes a statement. Which outfit would be your staple this summer? Let me know in the comments below!